Gains With Gadgets: Four Fitness Accessories That Actually Work! No outlandish abdominal claims here, just great ideas brought into life. Meet four accessories that deserve consideration in your fitness arsenal! Quick: Think of a totally absurd fitness gadget that you wouldn't be caught dead using. Pretty easy to do, right? You see them all around you, on television, piled up in second-hand stores, and peeking sheepishly out of other people's gym bags. You stop, look for a second, and chuckle to yourself. Seriously: What the hell were they thinking? Just because climbing into the latest "core-strengthening" thingy isn't your thing doesn't mean you couldn't benefit from a little helping hand, though. The right accessory can help you do what you already do, only better. It can boost your form on the lift that's most important to you, help maintain your conditioning when going to the gym isn't an option, or make you ache in a way that makes you see the light. Here are four recent entries to the market that we tried ourselves, and which we determined have the potential to finally give fitness gadgets a good name. If you're interested, get your own. We're not sharing. Is there a fitness accessory that's won your heart? Let us know in the comments. As anyone who has picked up a jump rope after years away can attest, wielding that familiar childhood implement is a skill, not just an "exercise." There's a reason you don't see it much in the contemporary non-Crossfit gym: nobody wants to admit to being as bad at it as they are. This is a shame, because jumping rope has a lot to offer. Aside from the benefits you might expect, such as endurance, coordination, and body awareness, a few minutes of jumping can also scorch the gamut of muscle groups, from the calves on up through the shoulders and forearms. This became immediately clear once the CrossRope, a new weighted jump rope system, began circulating the Bodybuilding.com office. CrossRope offers seven progressive weights of cable, ranging from the floss-like 1.9-oz "Sprint" to the "Titan," a 3-pound behemoth that looks ready to tow a wayward cruise ship into port if necessary. The lightest models, which are available as a "Swift Set" or individually, are perfect candidates for practicing double unders and other speed work. On the other hand, your first impulse upon grasping the cables making up the "Brute Set" won't be to jump rope but rather to leap it, probably while repeating "Whoa my god!" in terror. Speed Rope and Weighted Rope System by CrossRope! Of course, that's not the way to use a CrossRope, but rather the way to get whacked in the back of the head by a CrossRope (which actually doesn't hurt as much as you might think). The real challenge is to "get quick" on a slightly heavier model after becoming comfortable with a lighter one, according Dave Hunt, the former Navy pilot who invented the CrossRope. The limited number of studies on weighted jump roping suggest it has the potential to boost shoulder strength and mobility, besides the better-known full-body athletic benefits. The shoulders and forearms are definitely where our testers reported feeling it the most (aside from the toes—wear your shoes!). 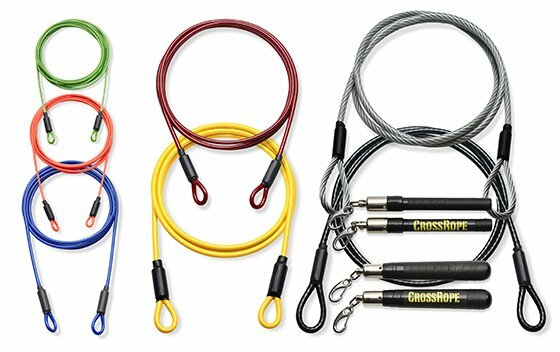 The CrossRope's handles are probably heavier and more substantial than most ropes you've tried, but they spin smoothly and switch between cables easily. Just as crucially, the CrossRope site offers ample guidance on sizing and integrating progressive jump roping into training. A downside is that it's definitely an indoor-only rope, because its vinyl coating can get slowly shredded by concrete or asphalt. But keep the CrossRope inside your workout temple, and it might be all the rope you need. Self-myofascial release, aka "foam rolling," is rapidly moving out of the shadows and into the fitness mainstream. It's like the fish-oil of movements, in that most athletes have heard from someone or other that they're "supposed" to do it, even if they're not exactly sure why or how. The why is usually answered by a few days' worth of home experimentation: because it hurts so gooood. Advocates say that rolling helps them deal with muscle soreness and recover from intense training, and some recent studies have concluded that it can help increase joint range of motion. An increasing number of trainers even advocate tissue rolling or smashing (using some type of hard ball) as part of a warm-up before weightlifting, rather than simply while watching television at home. It was only a matter of time, then, until companies started combining and synthesizing the rudimentary rolling implements into more precise (and pricey) modular devices. The BodyWrench is one of the latest of these, and when it comes to tissue manipulation, it's a smashing success. 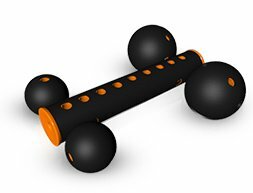 Looking somewhere between a primitive precursor to the Mars rover and some type of bizarre royal scepter, this device integrates the pinpoint-accuracy of a lacrosse ball with the directional rolling of a foam roller or PVC pipe. With all four balls on the ground, it's a lower-and-mid back roller superior to any foam device I've tried. Take the balls off the sides and stick them on the end to smash the calves and a few places you never knew could benefit from rolling, like the vastus medialis, infraspinatus (just behind the armpit), and the upper and lower pectorals . The balls alone, which are easily removed, seek out trigger points in the piriformis/glutes, calves, feet, and anywhere else you're brave enough to venture. The BodyWrench is also marketed as an exercise implement, though it takes a bit of imagination to make it work. It seems to function well for a fallout-style push-up, ab roll-out, or a sliding mountain climber, as long as you have the Total Fitness and Recovery package, which includes two Body Wrenches. That said, the primary appeal of this device is definitely its prowess at tissue rolling, so the one-Wrench Recovery Advantage Package will suffice for most. A warning: The first time you lay back into a crunch position on a Body Wrench, you will hate it, and your groans will attract the attention of every other sentient being within a block. They will want to try it, and they will hate it at first, too. But within a few minutes, you and they will both discover the exact sensation touted by everyone who raves about foam rolling and other forms of deep tissue manipulation. At that point, consider investing in an extra bike lock. Does the Body Wrench replace the foam roller or make it obsolete? I wouldn't go that far. Rolling the notoriously painful IT band with the Body Wrench was torturous above and beyond what seemed appropriate, whereas with a foam roller it's simply really painful. The extra height of a foam roller is also still advantageous when rolling the hamstrings and possibly the glutes, though this may vary according to anatomy and improve as you become accustomed to the Wrench. A warning, though: the Body Wrench works best through a layer of clothing. Its grippy black surface has a tendency to grab and pull all varieties of body hair—even ones that are barely visible. That's definitely not a case of "hurts so good," so get out your old warm-up pants. When you first pick up a pair of Globe Gripz, you might be totally mystified. What is it? A grip-building squeeze-ball? Beefed-up beads for a bodybuilder's necklace? Put these sturdy plastic balls on a barbell or lat pull-down handle, though, and you'll discover a versatile tool that can add plenty of options to the basic gym, while also helping you customize your commercial gym experience. 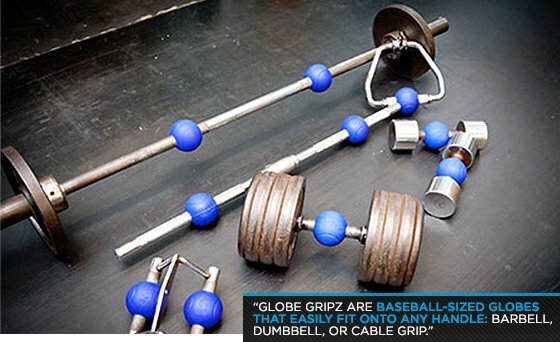 Globe Gripz are baseball-sized globes that easily fit onto any handle: barbell, dumbbell, or cable grip, either standard (1-inch) or Olympic (2 inches). They can convert any straight bar into a multi-angel curl bar. They also allow you to use a neutral grip with a straight bar when performing any pressing or rowing movements, a small change which many people find helps keep their achy shoulders from getting irritated. But this comes at a price: the pulling motions also become intense grip tests. You'll hate this when it makes you drop your coffee mug post-workout, but in the long term more grip strength is never a bad thing. The real attraction with the GlobeGripz is how they allow you to experiment and discover your weak spots. I attached them to an overhead bar and experimented with a multitude of grips for pull-ups. The difficulty level ranged from easy to almost impossible. For the first time, however, I could focus on my weaker fingers and build strength where it was lacking. I've been a proponent of using thick bars and grips like FatGripz (not made by the same manufacturer) for some time, so the appeal of custom grips was nothing new. However, these simple spheres have the potential to add a whole new dimension to thick bar training. This is especially true for pitchers and other throwing athletes who can practice sport-specific training in the weight room with a new level of specificity. The website for powerlifter and Bodybuilding.com columnist Mark Bell's invention the Sling Shot is howmuchyabench.net, so it's clear that it's meant to appeal to lifters who like to push up some serious weight. It has quickly developed an incredibly loyal following among that community, too. People who own and use the Slingshot have a tendency to talk about it with a misty far-off look in their eyes. Bell's lifting pedigree is rock-solid as well, so this was definitely something I had to try for myself. Click over to the Sling Shot's website, and the selling point is clear to see: "Bench Heavy with No Pain." It also claims to add 10 percent to your bench press. I used to compete in the bench press, but years of heavy pressing took its toll on my shoulders, to the point that I was sure my bench press days were over. So yeah, I was a little skeptical going in. Due to having been away for so long, I chose the Reactive model, which is slightly more flexible and pliable than the Original, and is designed for higher reps. There's also a heavy-duty Maddog models, which is recommended for weights greater than 350 pounds. The basic construction is consistent in all three. It's basically a wide strip of tough elastic and canvas, into which you fit your arms up to the elbows before setting up to bench press (or do push-ups and dips). As the bar descends, it stretches the Sling Shot across your chest and then assists you with the press. The higher the bar ascends, the less assistance you receive, until you control the entire weight on the bar just before lockout. I thought this restraining device would feel strange and uncomfortable, but it actually felt natural. It doesn't impede form, but actually seems to improve it. I was also surprised to find out that for the first time in two years, I could bench without shoulder pain. After just one month of using the Sling Shot, I was back to pressing heavy weight for high reps.
For approximately $50, this is a must-have item for any lifter with shoulder pain. If you're a powerlifter who competes using a bench shirt, you'd be insane not to have at least one in your gym bag.